Nine pm on a Tuesday night in Melbourne and there is no better place to be than the Capitol Theatre. 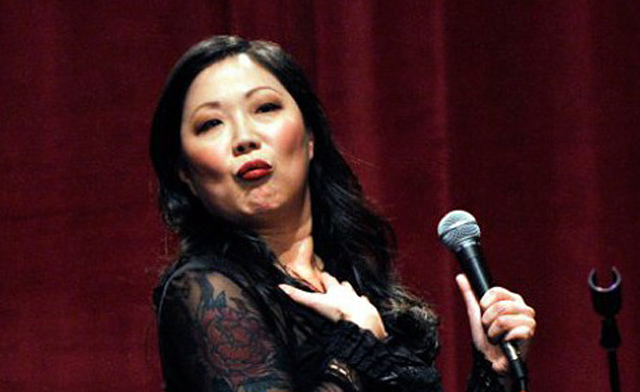 Not just because the venue resembles the inside of an egg carton (well partly, perhaps) but because its definitely worth making the effort to see Margaret Cho in action. Flustered and initially somewhat incoherent she stumbled through the first ten minutes, confessed her disappointment at being turned down by her Australian girlfriend; and after a few too many fillers launched into what has to be one of the most delightfully honest nights of comedy. Cho’s humour bristles. Her anecdotes are memorable not only because she is a natural storyteller but is completely fearless about exposing a range of past experiences – some exceedingly personal and therefore all the more powerful. She bares all – metaphorically as well as literally. The story of being told to cover up her tattoos is accompanied with an exhibition so we can see ‘where that turtle might be heading in a few years’. As she made herself comfortable on the stage floor the atmosphere grew more intimate. Almost like a soiree, especially if you were sitting in the front row. Because then you were mocked for your strangled monosyllabic responses. But in a good way. Cho is not cruel and laughs both at her chosen victims but also with them. From Julia Gillard and Madonna to growing up as the daughter of Korean parents in San Francisco; being Chris Isaac’s lover and Woody Allen’s favourite; the topics of conversation are unpredictable. However, with a very healthy discussion of eggs, glue and some weird things people do behind closed doors, there was plenty said. And that doesn’t include a rant on the aforementioned naysaying girlfriend. Nutella and nail treatments will never be the same. So go ahead, check out the show. The innuendo is worth it. a few original thoughts on this subject. Really.. many thanks for starting this up.